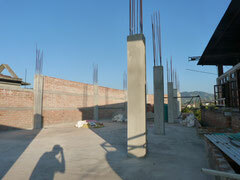 School extension phase 3 (and last building activity) - SAHAYA Nepal e.V. Webseite! As you can see from the photo some pillars and wall elements have already been constructed (then the money run out and the activities stopped). Unfortunately the prices for construction materials literally exploded when so many rebuilding and repair activities were started after the earthquake in 2015; still vast areas lay in destruction despite the extended activities to rebuild the city. So the last floor has to be planned at elevated prices and will be much more expensive but the floors below. By using the form below you may donate right now for the project via betterplace.org who will provide also the tax statement for you (for all the year donations, in German only, unfortunately).